When Governor Brewster lived here at the Brewster Inn in Dexter Maine, he had lilacs all around the property line. When he died, the lilacs were killed off by all the trees that started growing over a period of time. 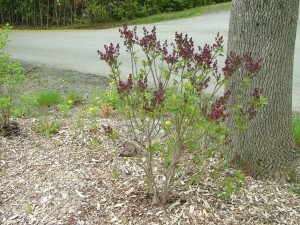 In September 2010 once we had cut down a large amount of trees, we decided to start replanting the lilac hedgerows. No small task considering the size of property we have. We planted the first 24 bushes using 7 different varieties making sure that there was a sequence of different colours all along. After a month of watering and a hard winter, we waited… and waited… and waited for signs of life and sure enough buds started appearing about 2 weeks ago. Today i took a couple of photos to show their progress and it looks like in the next 2 weeks we will get lilac smell and colour! This is especially exciting as so many guests to the Brewster Inn have commented on the lilac smell all around when they used to live here in Dexter Maine. Mine have got a little way to go yet but all being well we should get some great colours and lilac smells this year before planting approx another 33 bushes at the same time this year that will cover along the back of our property. Next post will be all about why the mechanical digger was in the garden today digging holes. This entry was posted in Gardens, Seasons and tagged Beauty of Moscow, Brewster Inn, Dexter, Ellen Willmot, Governor Brewster, James McFarlane, lilacs, Ludwig Spaeth, Maine, Pocahontas, President Grevy, Primrose by admin. Bookmark the permalink.